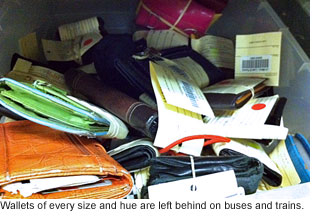 County Supervisor Zev Yaroslavsky’s website just posted a good story on Metro’s lost-and-found operation, which tries to reunite thousands of missing items with their owners each year. [There is] a new computerized system in which a barcode is assigned to each of the thousands of items left aboard Metro trains and buses each year. The items are logged in a computer database, making quick scans for likely matches possible. And the traveling public can now submit online claim forms for missing items. A personal visit to the Lost and Found, located in Metro’s Wilshire/LaBrea Customer Center, is still required to pick up missing things, although Riley will mail items to out-of-towners. The article is a pretty entertaining read and includes breakdowns on the vast number of things left behind on buses and trains. Wallets, as expected, get separated from their owners on a frequent basis. And so do — somewhat mysteriously — bikes, to the tune of about 2,000 a year. If you can explain to me how that happens, I’m all ears. I left my red Victoria Secret purse today at Bus #55 in 6th Street and Broadway around 6:00pm. Can you please help me find it.